Company "Google" is working on a test feature translation service of the search engine page directly . Operating company "Google" is currently testing a new feature that allows users to access the translation service affiliate of search engine page directly. 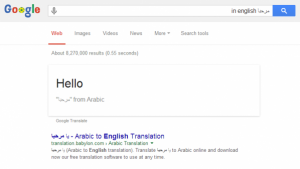 Will appear, for example, when writing the word "hello in English" field within your search engine, translation of the word "hello" in English with the origin of the word. But when you write a word or Translate Translation or Translate Tool will appear within the search engine tool for translation within the search engine page with the possibility of moving to service Altjermh of the company.